As you may have noticed there is a lot of anger in the world these days. Many folks are worried about all the tension and outrage that is floating on the air. In fact I am very excited. Why you ask? Because I have after many years of intense research discovered the secret to harvesting and converting atmospheric human emotion to electricity. I can’t give away any secrets but basically I place my angry antenna somewhere high and it picks up all the bad vibes floating across the atmosphere. It then runs from there to a set of re-chargable lithium batteries where it is stored till needed. The angrier people are the quicker the quicker the batteries fill up. Think of it, everytime you have a shouting match with a loved one, or a social media battle my angry antenna will pick it up and generate power. It could change the world. Angry at Donald Trump? You’ve just helped a hospital run its lights for a week. Angry at Hilary Clinton? Your rage has helped power a water well in the Sudan. Stubbed your toe? An cat orphanage in Argentina X Ray machine will work. So what do i want from you? 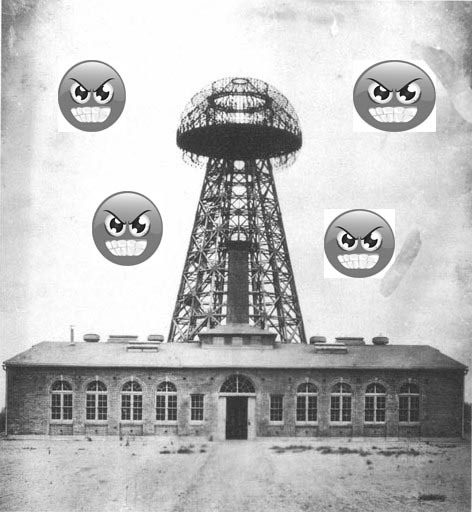 My invention works but I now need funds to buy Nikolai Tesla’s old lab at Wardencliffe, New York. Here I will erect a three thousand foot tall tower to harvest the pissed off energy of New York City. I won’t lie, it will be expensive, 40 million dollars but it’s a small price to pay to change the world. on Friday, 26 January 2018.